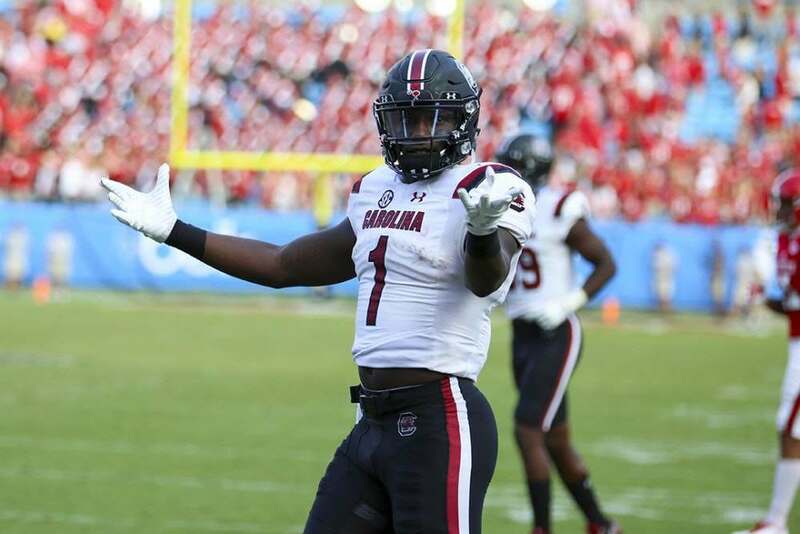 There are a lot of fans around Cowboys Nation who are hoping former South Carolina Wide Receiver Deebo Samuel is still on the board when the Dallas Cowboys are on the clock in the second-round with the 58th overall selection. Samuel is the dream replacement for Cole Beasley for a lot of us, but would likely be a luxury this early in the draft instead of a need. I don't want to rain on the parade for all you Deebo Samuel fans, myself included, but I don't know if the Cowboys would pull the trigger on a WR that early. This is especially true considering there is someone who I believe compares favorably to Samuel and could be available at least two rounds later. In case you haven't figured out yet, I'm talking about former Nebraska WR Stanley Morgan Jr.
Deebo Samuel of course is the more hyped WR and is in the running as one of the top five receivers in the 2019 draft class, but Stanley Morgan Jr. shouldn't be considered a consolation prize. These two WRs could be a carbon copy of one another on paper and tested surprisingly similar at the NFL Combine as well. Arm length 31 3/8" 32 3/8"
Hand size 10" 9 7/8"
As you can see from the measurements and the testing, Deebo Samuel and Stanley Morgan Jr. are amazingly similar on paper. The similarities don't end there though. Both players are devastating with the ball in their hands and easily create separation through their route stems. The only real difference I have seen between the two is Samuel is a little more thickly built and has been more productive as an outside receiver so far in his career. He is also the more powerful of the two, which serves him well in contested catch situations. That's not saying Morgan can't be just as effective as an outside WR. He just wasn't utilized in that manner during his time at Nebraska. As far as the Dallas Cowboys are concerned though, both Samuel and Morgan would be ideal inside/outside WR candidates capable of replacing Cole Beasley in the slot. The only question now is which receiver would the Cowboys prefer? It's really a tossup if you don't really know these receivers and have never watched them play, but not if you take into consideration what we know about the Dallas Cowboys. They like bargains, which is why I have a hard time believing they wouldn't be bargain shoppers in the 2019 NFL Draft like they have been so far in free agency. As much as we all love Deebo Samuel and the skill set he would bring to the Cowboys, investing a second-round pick might be too high for Dallas considering they can get a similar player at least two rounds later. Stanley Morgan Jr. is a bargain I just don't think they could pass up. This is all speculation of course, but it's definitely something to take into consideration when the 2019 NFL Draft gets underway. Deebo Samuel or Stanley Morgan Jr.? Which receiver would you draft?